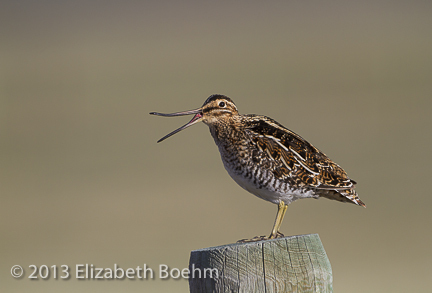 Wilson’s Snipe is one of my favorite birds. 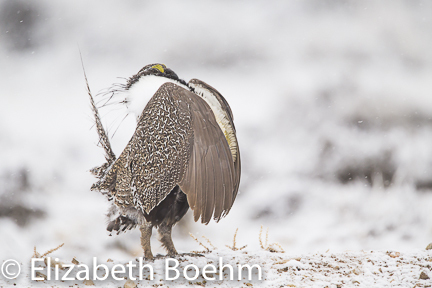 The “winnowing” of it’s tail feathers overhead is a sure sign of the arrival of spring in Western Wyoming. The eerie sound can be heard typically at dawn and dusk but also throughout the day with cloudy weather. An undulating flight pattern high in the air with short dives allows the air to go through the tail feathers creating the winnowing effect. Upon landing in the marsh, the wings go up and he alights gently to the ground usually close to his mate. 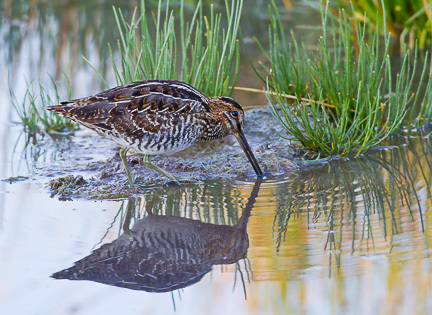 The snipe is an inhabitant of areas with soft, wet ground that allow probing for food with it’s long bill. The upper mandible of this bird is flexible and very sensitive on the tip allowing it to work as a probe to detect prey such as worms or insects in the mud. This flexible tip also allows the bird to grasp prey and withdraw it from the ground. I did not realize how flexible it was until I reviewed my images and saw the bend in the bill as the bird yawned. The snipe is a great bird to watch with it’s long bill and plump body which give it a comical look. I often see this bird sitting on fence posts announcing it’s presence or surveying its wetland. By listening and following the winnowing sound in the air, the bird can be spotted and easily followed with binoculars. 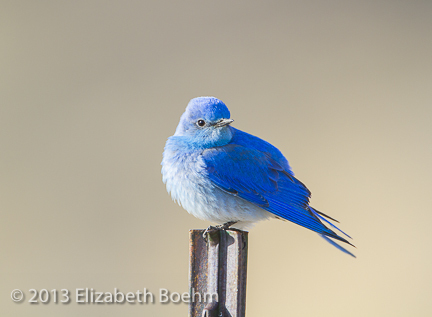 Mountain Bluebirds are an incredible site for winter-weary eyes. 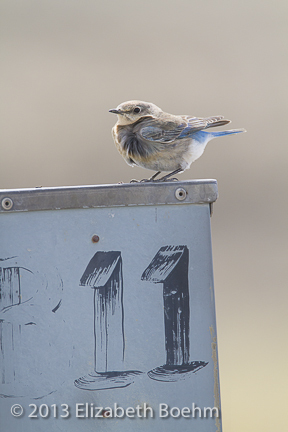 They really are very blue when seen against the springtime sagebrush. This pair easily caught my eye while I was out exploring a sage area looking for Loggerhead Shrikes. These two were being creative in their nest location as they need a cavity of sorts and the trees were not so close. They decided to take over an electrical box hook-up at an abandoned RV camp. I have passed by this location and never took a second look as it was cluttered with human garbage and just rather ugly! 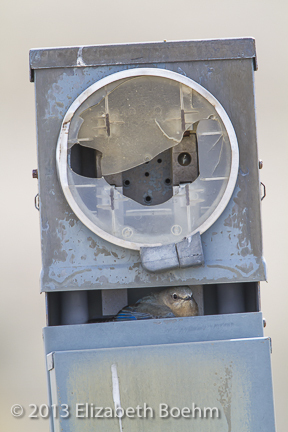 This pair of bluebirds were quite entertaining as they set up housekeeping. They were also very cooperative for this photographer and it was amazing to see something so beautiful in this rather ugly mess humans have left behind. 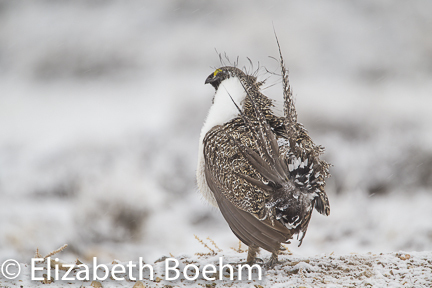 I call this Greater Sage Grouse “Survivor”. I can only imagine he survived the attack of a predator by giving up almost all of his tail feathers. He did continue to hold one of the top spots in the lek!